Beautiful Sanibel home, close to Bowman's beach & 'Ding' Darling. Welcome to our charming house on beautiful Sanibel Island. We would like to invite you to take some time to relax and enjoy all that Sanibel has to offer while staying at our home away from home. Located alongside the luxurious Sanctuary golf course, our house is close to beaches, restaurants, shops, golf and the world famous J.N. “Ding” Darling wildlife sanctuary. Our home has been totally refurbished and is available for rental by the calendar month. There are 3 double bedrooms, all with en-suite bathrooms, which will sleep up to six people. Quietly situated in an acre of garden, the house has a private heated swimming pool, which is fully caged for your comfort and has all the amenities you would expect including a fully equipped kitchen and separate utility area, 60' plasma TV, Xbox, Xfinity cable tv and US/Euro Blu-ray/DVD players, master bedroom with its own lanai and 50' plasma TV plus ultra fast broadband wireless internet so you can work or stay in touch with friends and family via the web. While having a car is recommended, all facilities including Bowman's beach are an easy bike ride away. We have 5 adult bikes plus a bike trailer for your use. We also supply guests a cool box, beach chairs and sun umbrella. Home away from home: The house is spacious and modern while retaining the charm of an island cottage. We have just completed a total refurbishment so everything is new and up to date for you to enjoy during your dream vacation. Discounts are available for rentals of two or more months. We live in the south of England with our two children. We've been regular vistors to Florida since the 1980's and fell in love with Sanibel Island while visiting relatives in Fort Myers. We are now semi-retired, which enables us to visit Sanibel more frequently of late.Our ambition is to make all our guests feel welcome at Dinkins Cottage and that they leave feeling they have enjoyed their stay and would like to return. So far we have had many repeat rental guests, so we are achieving our aim. We have travelled extensively across the USA, Europe and Asia with our family; however we felt at home on Sanibel as soon as we travelled over the causeway! From the moment we saw our property in its fabulous acre lot, we fell in love with it. However, the property was run-down and badly needed re-modelling but we saw the potential to create a perfect vacation home for ourselves and for rental guests. 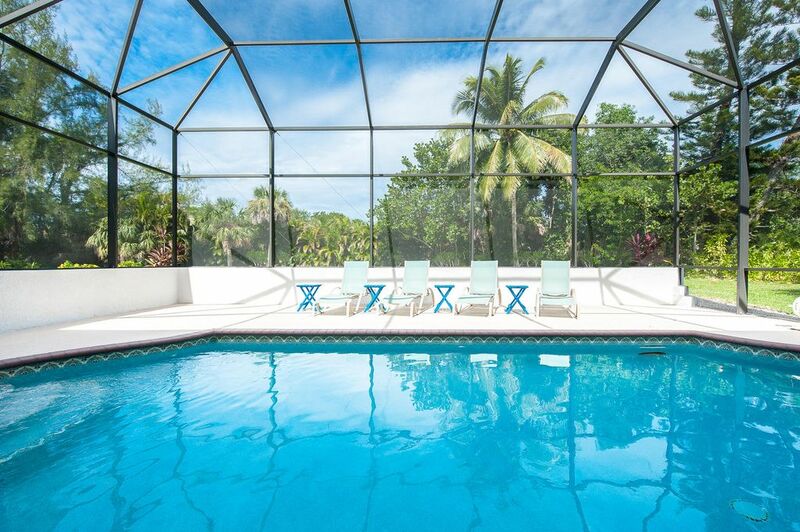 The property is well situated to access all the facilities of both Sanibel and Captiva. We especially enjoy the tropical breezes that cool the house, lazing in the heated pool, sitting on the lanai, viewing the amazing wildlife and gently cycling to Bowman's beach or Blind Pass to swim in the sea and watch the sun go down. This is our home, rather than simply a rental property and is very well equipped. As we primarily use the home ourselves and we ensure that it is kept in excellent condition and is truly a home away from home. All bathroom suites use high quality fittings and feature granite countertops. Free local and national calls. International calls not available - bring a cell phone if required. Open plan kitchen with granite work surfaces. Silverware, plates, pots and pans provided. Yamaha A/V amp allows Apple Airplay streaming. It has internet radio too. 4 Sunbeds on pool deck, 4 occasional chairs on lanai, plus dining table with seating for 6. 2 sets of golf clubs avaiable. Please replace lost balls. We thoroughly enjoyed our 2 month stay in this modern, clean, spacious home situated on a huge, beautifully landscaped lot. The owners were always immediately responsive to our questions and minor issues. We had met the owners the year before, and because they had a charcoal grill while we preferred gas, they graciously arranged to split the cost of a gas grill, ordered and delivered it, and even picked up the propane tank from the local market. The bedrooms are spacious, each with large bathrooms, walk-in showers, and large closets. Ceiling fans and open doors kept the home pleasantly comfortable- as did the occasional use of air conditioning which was quiet and efficient. We especially loved the screen enclosed balcony/pool which brought the outdoors in with the ability to open the sliding doors and still enjoy the sounds of nature. Pool was delightfully heated at 86 degrees, allowing us to swim daily, even during the occasionally chilly days in January. The surrounding neighborhood is beautiful with plenty of areas to walk or bicycle; we had a favorite 6- mile walking loop each morning. Although we had bought a beach pass to use at Bowman’s and Turner beaches, we rarely went, as we so enjoyed the sanctuary of this home- but of course beach walking and shell collecting are a must. Despite it being crowded in town with tourists, this home truly provided a respite from the crowds and noise, as it is close to the Captiva junction. Yet, it was easy to get into the main part of town for shopping. The Sunday farmer’s market was another favorite- one of the largest and best we have ever seen. Favorite lunch spots were The Clam Shack ( best lobster rolls!) and The Thistle Lodge. We preferred dining in at dinner, and also loved the smart TV where we could utilize our Netflix and Amazon subscriptions, as well as the on demand feature. Both Ding Darling Nature Preserve and the CROW clinic are very close by- and both are a must see. While we had stayed in Sanibel several times in the past for week stays in Timeshares, this trip allowed us a chance to feel like we were part of the community, and to appreciate the uniqueness and friendliness of this special island. We highly recommend this home, and we so appreciate the owners’ generosity in sharing their home and being so helpful. Thank you so much for your kind review. We look forward to welcoming you back to Dinkins Cottage in the future. We stayed at the lovely Dinkins Cottage over the Christmas holidays for two weeks. It was exactly as we envisioned from the photographs and the description of the property -- clean, spacious and all the amenities for a busy family of four looking to slow down and unwind on the island. For us, the location was perfection; further away from the busier parts of Sanibel and closer to Captiva. The Cottage is located in a beautiful neighbourhood on a private and quiet large-sized lot. There is barely any car traffic and the lot is full of dense foliage that invites an abundance of bird life and the occasional appearance from the resident tortoise. The foliage also provides privacy from the neighbours as you can't see/hear the next house over. Inside the Cottage you'll find all the appliances and furnishings in good working order and well-stocked with supplies (toilet paper, laundry soap, spices, etc.) that you don't always find when renting a short-stay home rental. Our kids enjoyed the pool daily and we loved being a short bike ride from the back entrance to Ding Darling National Wildlife Refuge and to Bowman's Beach. Bikes are provided at Dinkins, though they are adult-sized and were just a tad too big for our kids. We rented a pair of kids bikes (comes with a helmet) from Finnimore's which worked out just fine. The one thing that we weren't prepared for -- and this is not a slight against Dinkins Cottage whatsoever -- were the no-see-ums (otherwise known as midges or sand fleas). Ensure that you have an arsenal of bug spray with deet or pick up the local No No-See-Um Natural spray. Worse than a mosquito bite and you can't see them as the name suggests. There was some leftover spray at the Cottage, though we re-stocked and left ours behind for the next guests. Working with the cottage owners, Caroline and Desmond, was a breeze. They kept us well-informed after Hurricane Irma came through (minimal damage thankfully though you wouldn't know it) and they were always responsive, provided clear instructions, and very pleasant to deal with. We would highly recommend this property and would consider it again for a future stay on Sanibel. Dinkins Cottage is a comfortable and spacious home away from home; perfectly situated to enjoy all Sanibel and Captiva have to offer, while also offering peace and privacy for a relaxing vacation. We would definitely rent this property again. The owners are easy to work with and very quick to reply to messages. We had a fabulous 2 week stay at Dinkins Cottage on beautiful Sanibel Island. The house is exactly as pictured; it is modern, spacious, immaculately presented, has a wonderful pool and we enjoyed dining outdoors on the covered lanai. The property feels very secluded set in its own lush tropical garden, complete with Gopher Tortoise! The location is great for exploring both Sanibel and Captiva, especially if you use the bikes provided - we hardly needed to use our car. Sanibel has no big chain restaurants or shops, instead it has independent local businesses and therefore feels very much like a true island getaway. We would have no hesitation in wholeheartedly recommending Dinkins Cottage. We recently returned from our March 2015 stay in Sanibel, at the Dinkins Cottage. The house accommodated our family spaciously (adults and children), and we loved the house's privacy from neighbors and roads. It is well situated for a short bike ride to Bowman's beach, for our daily trips. We loved coming home from our daily trips to unwind in or by the pool or on the back deck in the evenings. The thorough house amenities were well appreciated and served us plenty! Great place to stay while visiting Sanibel island! Thanks! My family had the pleasure of staying in this beautiful home for the month of February, 2015. We could not have asked for a better place to enjoy Sanibel. Total privacy, quiet and lovely upscale neighborhood, beautifully maintained yard and abundant wildlife. Resident Gopher Turtle made several celebrity appearances and Osprey, Kestral and Red Shouldered Hawks made multiple daily visits to the roosting tree clearly visible from the dining room window!! The house itself is well equipped with all you could want, very easy to keep clean and the pool area is wonderful. The garage is stocked with all kinds of pool accessories and perfect bikes for enjoying sight seeing. We will be back!!! We are delighted you enjoyed the wildlife and the facilities such as the heated pool and the bikes. We'd be delighted to welcome you back! Located in the Santiva area of Sanibel, our home is located alongside the Sanctuary golf course. We are conveniently located for Captiva's beaches as well as Sanibel's premier attractions. We are a bike ride away from the world famous Bowman's beach and the J.N. 'Ding' Darling Nature reserve. The area is convenient yet tranquil and the house is set in over an acre of private garden with abundant wildlife and birds. There is a residents' boat dock at the end of the road with easy Gulf access. Sanibel city ordinance requires monthly rentals for homes on Sanibel. In peak season January through April we rent by the calendar month. Discounts are available for rentals of two or more months.